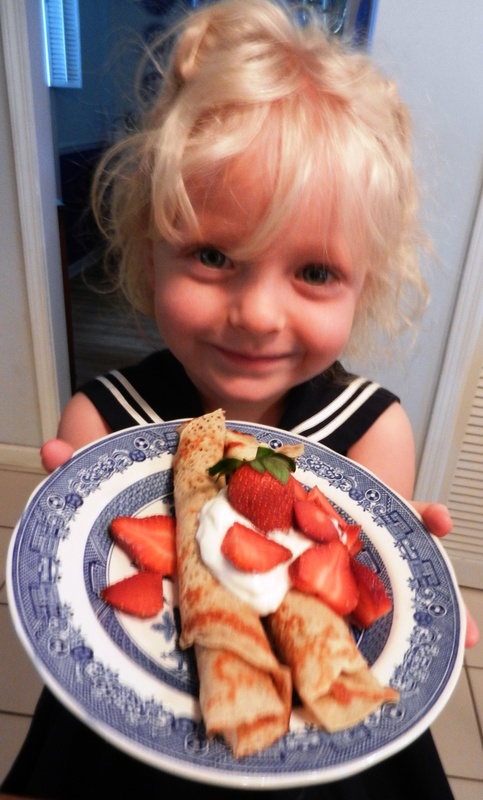 I absolutely loved helping my mom make crepes when I was a little girl. We would make a huge batch on Special occasions and it was always my job to oversee quality control by eating any that weren’t perfect circles. With spring break around the corner I am planning a similar adventure with my kids. I always try to plan a few fun kitchen activities when they are on vacation from school. 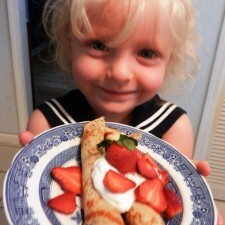 I’ve altered my mom’s recipe to make these crepes much healthier. I also like to add a generous amount of Kelapo extra-virgin coconut oil– since I know it helps give us the energy we need to start the day. This recipe is easy to adapt- you can add cinnamon to the filling, top with a different fruit, or use honey mixed with coconut oil instead of sugar. I hope you enjoy this fun cooking activity with your family over Spring break too. Chef Jessica's daughter, Madeline, loved them! Heat a 10” non-stick frying pan over medium heat and brush the surface with the coconut oil. Pour slightly less than ¼ cup of the batter on the hot pan and tilt the pan to evenly coat the bottom. 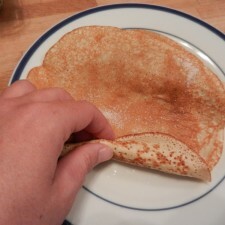 Allow to cook until bubbles appear and the crepe begins to appear drier on top. 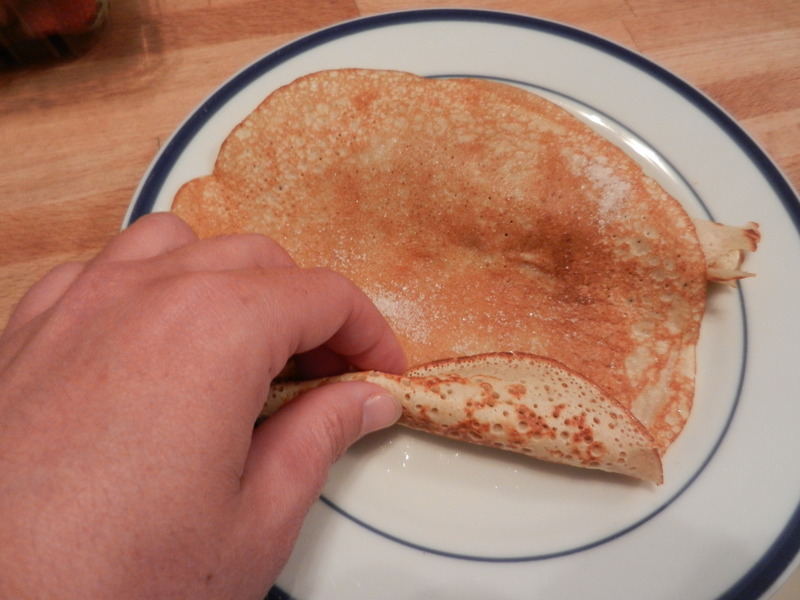 Gently turn the crepe over and allow it to cook for a few more seconds on the other side. Remove from pan and spread the top with a thin layer of coconut oil, sprinkle with sugar, then roll up. 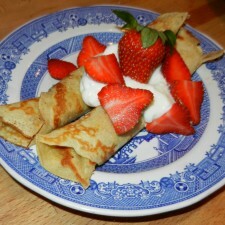 Repeat with remaining batter then serve the rolled crepes garnished with the strawberries and yogurt. Yield: about 10 crepes. 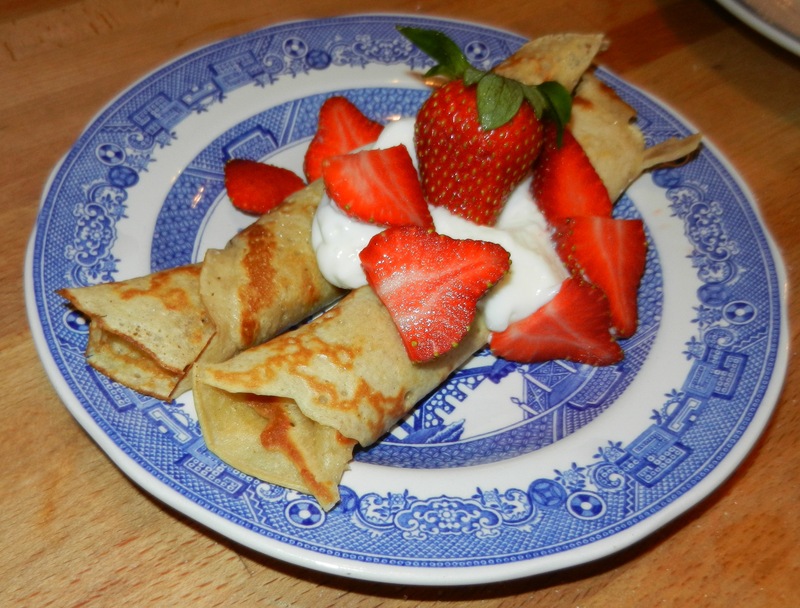 Vanessa – We have not tried it with oat flour. If you give it a try let us know how it turns out!